The March to AXIS begins here! Magneto has returned to Genosha in search of uncovering the what the Red Skull is doing on the once-upon-a-time mutant refuge. But what Magneto discovers leaves him first shocked and then resolved to put an end to more mutant atrocities. What happens when a magnet loses it magnetism? It leaves behind a rusty lump of old metal. Magneto surely must be feeling similar given the latest issue (nine) of Magneto. As Magneto sneaks onto the former island he once ruled firmly, he discovers a scene that is all to familiar to the concentration camps he was confined to in his youth. The contrasting of atrocities from the camps of Nazi Germany and the camps of the Red Skull are a deliberate aspect explored in the plot. The fact that the Red Skull is a World War II relic heightens this fact. However, as was the case in the camps of his youth, Magneto is struggling again with his mutant powers when confronting the X-Men in Magneto #9. The events of AXIS are poised to hold a lasting impact for both the Avengers and X-Men, and Magneto is going to play a large role in this. As the first to discover some of the intricacies of the Red Skulls actions on Genosha, Magneto is on center stage to the first act of AXIS. It remains to be seen if he will survive the experience in one piece though. Cullen Bunn has set up a strong narrative line in the Magneto series and this is going only enhances by Rick Remender's AXIS. The dark feeling Bunn delivers is matched my the tight rope that Magneto must walk as he strives to right wrongs against mutants. All thought of redemption has long been pushed aside, the only thing that matters now is the future for all mutants. Bunn's collaboration with Remender is pushing some of the ideas that were proposed for Magneto however, the story so far has been a great read. There are surprising twists and developments that were unexpected. All of this is strongly supported by a unique artistic style from Gabriel Walta and Jordie Bellaire. Bellaire's colouring is overwhelmingly appropriate for the setting of prisoner camps. 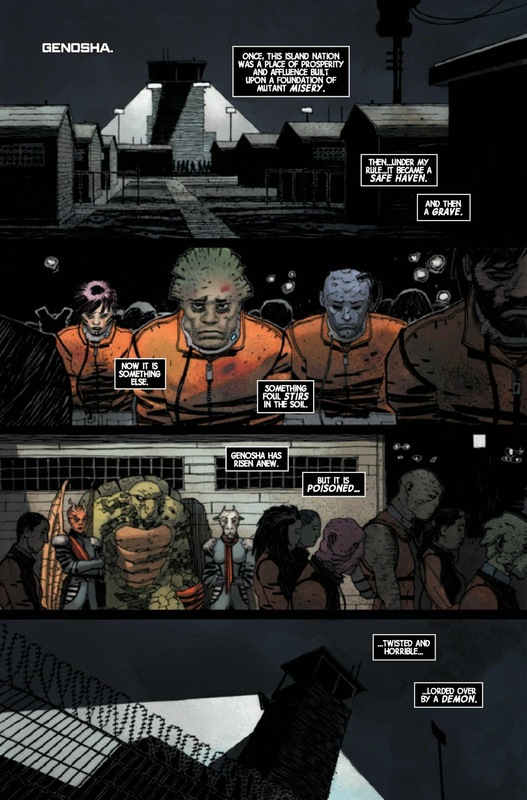 The use of dark colors, shadows, and light play provide a stark contrast to other titles in the Marvel X-Universe. It is a positive to be recognised in this manner. The horror hits home to Magneto. Walta's artwork is likewise characteristically sombre and dark for the story material. 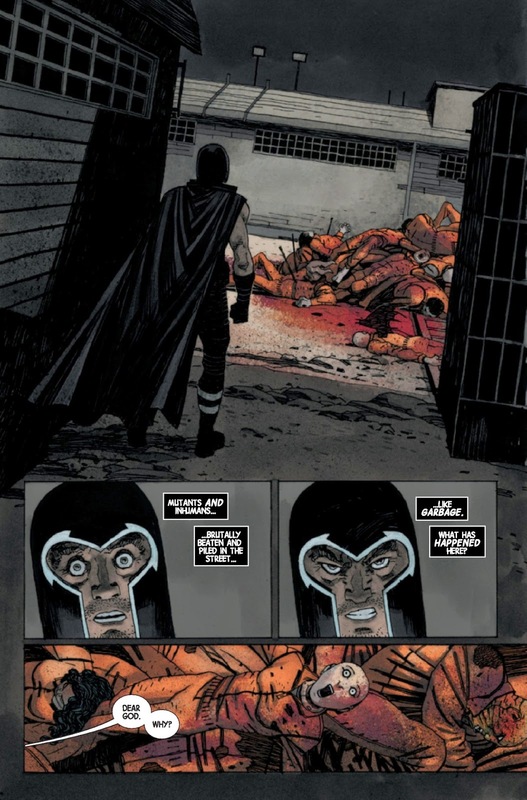 The artwork evokes the anguish of concentration camps and the struggle against oppression that needs to be demonstrated for audiences to buy into the need for Magneto to be the 'good guy' in this series. Magneto is an anti-hero, but we are provided the right reasons to know why we should be on his side through Walta's interpretation of Bunn's scripts. The end of the book leaves hanging to hope for more out of Magneto's noble determination to right the wrongs being perpetrated against mutants on Genosha. It doesn't look up for him though. I can't get enough of this series, it seems to be riding a strong wave of artistic endeavor that I hope will continue strongly after the events of AXIS. 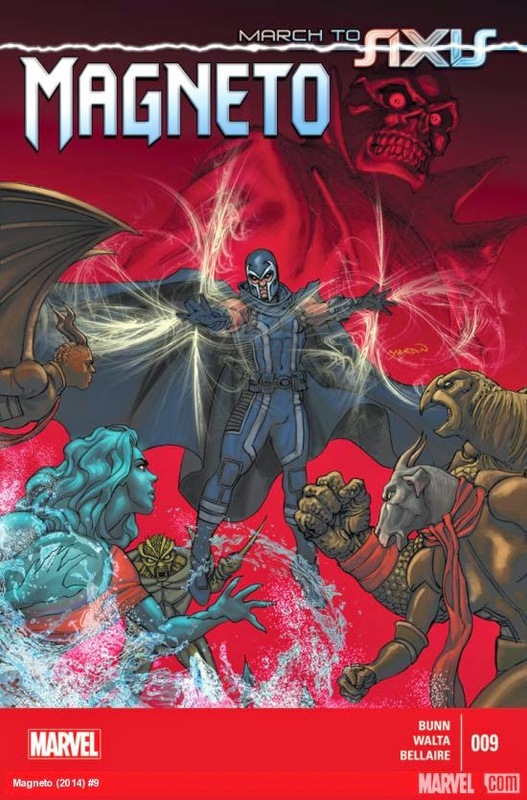 We have one more issue before the major Marvel event proper hits us in October, but what did you think of Magneto #9? What have you liked about the series so far? What do you think the future holds for Magneto? Leave your thoughts and comment below.